The T25/2 is an American tier 7 turreted tank destroyer. Un proyecto de cazacarros con una rotación completa de la torreta y un cañón de 90 mm sobre el chasis del carro de combate T23 propuesto en 1943. No se fabricó ningún prototipo porque nunca se fabricó en serie el T23 ni sus variantes debido al final de la guerra y la pérdida de popularidad de las transmisiones eléctricas. When fully upgraded, the T25/2 has similar speed and maneuverability to the T25 AT. However, unlike the T25 AT, the T25/2's turret cannot mount the powerful 105 mm AT Gun T5E1. 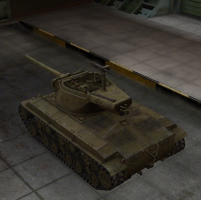 The combination of only being able to use the 90 mm AT Gun T15E2 gun along with poor armor limits the T25/2 to the second line on the battlefield. 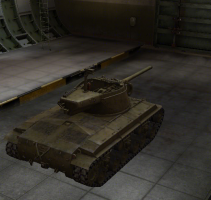 The T25/2 does get a fully enclosed turret upgrade, which increases its ability to withstand HE and artillery rounds. Using your speed to get into positions and provide fire support to your allies quickly while avoiding enemy fire is key to playing this tank destroyer. 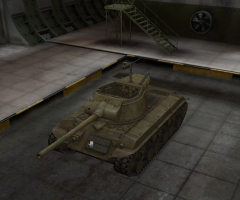 The T25/2 leads to the T28 Prototype. It is important not to think of this tank as a progression from the Hellcat, but rather as a larger Jackson as the TD plays much more like the slower Jackson than the speedy Hellcat . Its highest gun is adequate for its own tier, though it is rare to be at the top of the list. It is best to use this as a second line tank, sniping at already engaged tanks or hitting them from out of their range before relocating. The depression of its guns is excellent, allowing you to make shots that most opponents wouldn't expect, especially if you are on higher or lower ground, and can save you from some difficult encounters. It is imperative to aim for the weak spots on opponents as the T15E2 gun has poor penetration for its tier, and avoid fighting alone or spearheading an attack. If possible, try to remain undetected whilst killing off low-health targets. If detected, use it's speed to relocate before taking too much damage. 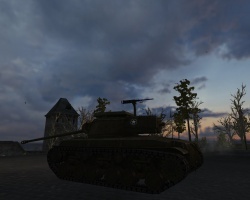 Coming from the M18 Hellcat the T25/2 may seem like a let-down, especially when it is stock but in the right hands it can be an excellent tank. The SCR 506 radio carries over from the T82, and should be equipped immediately. Next, go for the engine, as it greatly increases your maneuverability. The stock suspension cannot hold anything else now, so go for the next suspension upgrade. Then, the upgraded turret to hold the upgrade 90mm. Last, the upgrade 90mm, for an increase of 10 millimeters of penetration. With encounters with German Tiger tanks in Tunisia, tanks crews were wanting a tank with bigger guns than 75 mm and 76 mm. In March 1943 a new turret was fitted with a 90 mm AA gun and put onto a T23 model. The Army Service Forces placed an order for 50 of these tanks.1 10 of these were to be T26s. The first T25s were completed until early 1944. A request for 8,000 T25s and T26s with 75 mm and 76 mm guns was rejected. The T25 and T26 lines of tanks came into being in the midst of a heated internal debate within the U.S. Army in the mid-1943 to early 1944 over the need for tanks with greater firepower and armor. A 90 mm gun mounted in a massive new turret was installed in both series. The T26 series were given additional frontal hull armor, with the glacis plate increased to 4 in (10 cm). This increased the weight of the T26 series to over 40 short tons (36 t) and decreased their mobility and durability as the engine and powertrain were not improved to compensate for the weight gain. 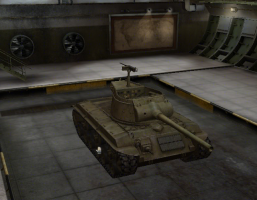 No historical records of the T25/2 tank exists. The T25 itself would have classified as a medium tank since it's a prototype for the M26 Pershing.